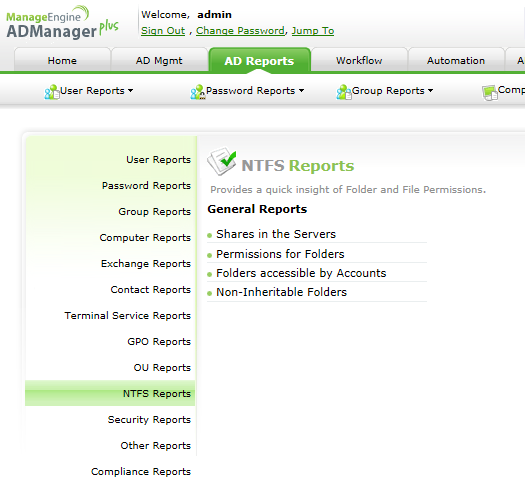 ADManager Plus has a dedicated module for NTFS permissions management, a very crucial management operation which determines the resources and the data that users can access. What's different about ADManager Plus's file server management? The file server management features in ADManager Plus let you manage permissions on shares, folders, and files in the Active Directory environment. This GUI-based NTFS permissions management provides clarity, and most importantly, an operational efficiency, which makes even painstaking jobs such as file server permissions management a breeze. Modify NTFS permissions - This option lets you change NTFS permissions on files and folders located locally as well as those on the network. All you have to do is select the relevant file or folder, the desired users or groups, the permissions (full control, read, etc.) and their type (allow/ deny). You can block or enforce inheritance, and even enforce the permissions set on parent folders to be applied to all the sub-folders. Modifying NTFS permissions of any file or folder is as simple as that and can be done in just a few mouse clicks. Revoke NTFS permissions - The permissions that users have on the local files and folders as well as the ones on the network can be easily revoked using this option easily, in bulk, and just a few simple steps. You simply have to choose the folder, the users or groups whose permissions need to be removed, the level of permissions and whether to allow or deny the selected permissions. You can also select the folder level (parent folder, sub-folder, etc.) up to which the NTFS permissions must be removed. Using the help desk delegation feature of ADManager Plus, you can securely delegate file permissions management to any user. 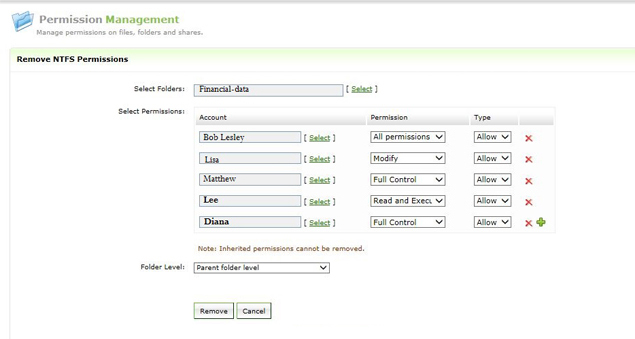 Furthermore, you can track permission changes of shared folders and file servers with the built-in audit reports. The technician and admin audit reports can be exported to CSV, PDF, HTML or Excel format, as needed. When permissions are managed in a disciplined and accurate manner, there is more accountability for actions and less room for misuse or tampering data of any kind. NTFS permissions management is important to manage security internally. NTFS permissions decide and define what actions users can perform on folders and files, both locally and also over the network. When compared to share permissions, NTFS permissions can be applied at more granular levels. Hence, the wise usage of these permissions can keep security threats at bay. Unfortunately, assigning NTFS permissions might not be a one-time action; it poses a lot of challenges. From time to time, NTFS permissions of a user might change. Say, for example, when employees' roles change (may be due to promotion or transfer), there will be a change in their group memberships, the resources that they will need access to, and so on. These changes are tedious when done one user at a time. Most of the times, the IT technicians assign permissions associated with the new roles and save the 'revoking permissions' part for another less hectic day. The security threat that lies in excess access is always sold short. Another big threat is the 'everyone' group - when there are many users to give access to, the 'everyone' group becomes the easy way out. With ADManager Plus' NTFS permissions manager module, one can discipline and organize the NTFS file permissions in bulk, hence making the environment more efficient and secure. ADManager Plus is a completely GUI-based solution that offers management features for Active Directory, Exchange Server, Office 365, Skype for Business (Lync), and G Suite from a single web-based console. Besides NTFS permissions management, some of its other notable features include bulk user management via CSV import and templates, 150+ predefined reports, automation of routine AD tasks such as cleanup, help desk delegation, one-click AD, Exchange, O365, Skype for Business, and G Suite user provisioning, customizable multi-level workflow, and so on. Get a free download of ADManager Plus' trial version and explore all its features in detail.